Audrey Rhodes is the president's daughter and all she wants to do is have a normal life: hang out with her friends, attend parties, and go on class field trips. Instead, she feels like living at 1600 is a prison rather than a privilege. But one night she discovers an old diary in her bedroom that belonged to Alice Roosevelt, former First Daughter and well-documented Washington rabble-rouser. Suddenly, reading of Alice's eccentric ways (that included walking around the White House with a garter snake around her arm) inspires Audrey to adopt the mantra "What Would Alice Do?" Audrey soon finds out, however, that approach is getting her into more trouble than she expected. Rebecca Behrens's debut novel is a smart, sassy romp through the life of a First Daughter at 1600 Pennsylvania Avenue. For readers who are fans of Meg Cabot's All-American Girl series, this is a comparable middle grade read-alike. While categorized as middle grade, I would place this on the older end of middle grade, right before a reader is ready for edgier YA titles. There is some mild swearing but nothing scandalous. 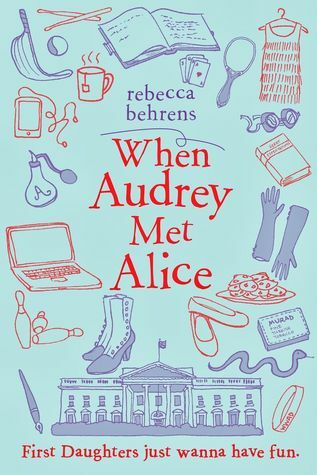 What I especially loved about When Audrey Met Alice is that Behrens not only made the president in this novel female, but she did so with very little fanfare, as if to show her young audience that the idea of a woman being president is just a regular day in America. It actually took me a while to realize that the president was female at first. I also love that Behrens endears her audience to learn more about the eccentric, wild child known as Alice Roosevelt. After reading this book, I know I certainly want to learn more about her! If I had one thing critical to say about When Audrey Met Alice, it's that I'm not entirely sure how believable it is for a First Daughter in this day and age to be using social media and email so freely. There are a few cases where Audrey talks about signing onto Facebook as if it's no big deal. It would seem if Audrey felt like a prisoner in her real life, that the Secret Service would also be putting the kibosh on her virtual life as well. I have a feeling if Sasha and Malia Obama were using social media unsupervised there would be too much that would get leaked by "friends" and classmates. Then again, that's just my feeling. I have no idea how the lives of the First Daughters are run. I would imagine social media is off limits though. Other than that bit of criticism, I thoroughly enjoyed Behrens's debut novel and look forward to seeing more from her in the future.